For the first time ever live on stage in Singapore, Twilight Sparkle, Rainbow Dash, Fluttershy, Pinkie Pie, Applejack and Rarity will take audience on an incredible and enchanting adventure in the wonderful world of Equestria! 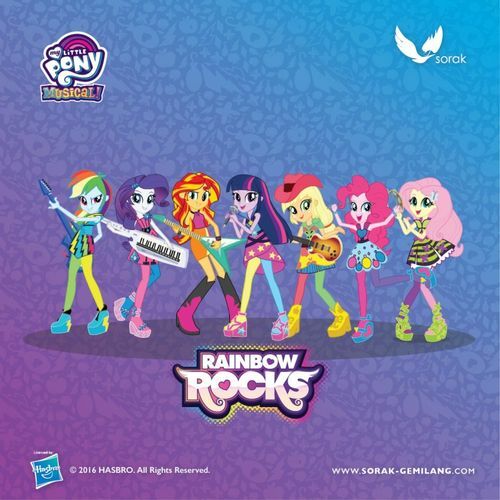 Sorak Gemilang Entertainment and Hasbro International Inc. are proud to present My Little Pony Musical - Rainbow Rocks. Singapore audiences will be amongst the first in the world to experience the magic of Equestria, as the Equestria Girls come to life in vivid colours on stage. Singapore is the second stop for this brand new musical’s world tour, right after its world premiere in Jakarta, Indonesia. Adapted from Hasbro Studio's hit animated movie of the same name, this 90-minute colourful and fun-filled musical is created for children and the young-at-heart from ages 2 to 96. It follows Twilight Sparkle’s exhilarating journey to defeat the forces of evil, with help from her human friends, the girls of Canterlot High School. Along the way, Twilight Sparkle learns that friendship really is magic! My Little Pony Musical – Rainbow Rocks premieres in Singapore on 24 November 2016 (Thursday) and seven shows will be staged over three days at the stunning Resort World Theatre at Sentosa. Tickets are available from all SISTIC outlets from 12 October 2016.